First these gardens were part of the ones in the Palacio de San Telmo and then were donated in 1893 by the Infanta Maria Luisa Fernanda de Orleans (Duchess of Montpensier) to the city. It was renovated by French engineer Jean Claude Nicolas Forestier, curator of the Boulogne Forest in Paris, who gave a romantic touch, inspired by the gardens of the Generalife, the Alhambra and the Reales Alcázares de Sevilla. 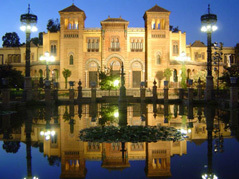 The squares of Spain and America were opened in the park, and they are some of the main attractions. It was inaugurated on April 18, 1914.